← Friday’s Foto Fun – Shhhh. Someone’s Hiding. If you remember when Bashful visited me a couple of summers ago, you might know where this is. Bashful, you know, is Bacon’s roommate. He’s one traveling kind of guy. For others of you, the skyline might be familiar. Woot! Guess in the comments and I’ll tell you on Monday. Oh crap. I’ve given the location away….. I swear. Take your eye off the ball for one second and this is what you get. Darn it. This entry was posted in The Scottie Chronicles and tagged dogs, pets, Richmond, Richmond VA, Scotties, travel. Bookmark the permalink. We don’t travel, so we don’t know. The Peeps travel for work, maybe they know. Both are at the store now, but will ask when they get home. Hope they are buying tasty treats!. Meanwhile, back at the ranch………will see what mischief we can get into. AROOOOOOOO! 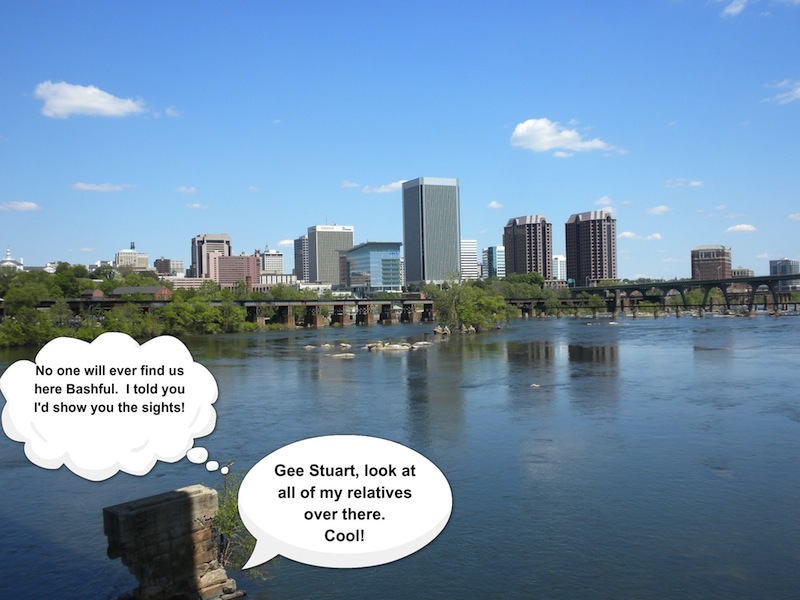 OK, Elsa (the smart one) did some sleuthing and she says it’s the St James river in your town of Richmond. We’ll go along with her guess since we can’t think of a better one. It is so hot that we don’t know where we are! Where ever it is, there’s a love of diverse architecture. There are big boxes, medium boxes and (wait for this) small boxes. Easy peasy you say? Not so much for us! Could it be by the Potomac River? Easy Peasy you and Bashful were at Richmond Virginia, the Confederate capital, near the James River. Why that was like a couple years ago. That is a great shot of the skyline of Richmond. You went to a fair with Bashful also. My Lee does not have a rock for a memory, she actually has some gray matter. Your Lee knows how to search. NO my Lee comes pretty darn close to a photographic memory aka Eidetic memory! And yes I see I called it first at 5:04p.m. nordhuesn came in a 9:33p.m.